Do you procrastinate or waste time worrying about things that haven't happened yet? Would you like to learn how to focus your mind on achieving the life you deserve? We all experience negative self-talk (it's that tiny voice in your head that tells you that you you are not good enough, or slim enough, or productive enough). But the Inner Critic is hard to ignore. And it's even harder to shut down. What you think affects how you feel and how you behave... do you recognise any of this...? You might be feeling anxious about something, worried about things that don't matter, feeling guilty for believing that you've said or done the wrong thing. Maybe you're feeling tense, or frustrated and stuck in a rut, or procrastinating about something you'd rather just get on with. You might experience physical sensations - your heart beats faster when you think of a specific situation, or perhaps you have aches and pains, or wake up fretting at 4am and feel exhausted the next day. Although most of us criticise ourselves for one reason or another, we never ever talk about it. You might even believe you are the only person having these thoughts, feeling worried, and beating yourself up...? This negative cycle is really hard to break. If it were easy we would all be much more productive, more successful and much happier just as we are. I bet that right now, if some of this resonates with you, your Inner Critic is saying things like 'yeah yeah, stop complaining' or worse, it's telling you that 'you don't deserve to feel happier'. How do you sabotage yourself, your career or relationships? Watch my Masterclass on how to Stop Sabotaging. Start Doing. “I decided to join Jess’s course because I felt ready to take back control, and be able to move forward with my life. I just knew there would be something I could take from this course and run with. The most enjoyable part was the camaraderie with the other members, sharing our Inner Critical thoughts and realising that I wasn’t the only woman beating myself up or feeling bad about myself. The main change for me is that I’ve taken more control of my exercise and eating habits. I knew I wasn’t acting in my own best interest, and that things wouldn’t change unless I made it happen. I've never felt like this before, honestly, I’m in control and haven’t wavered once which is feeding a positive cycle to keep going with great results (I’ve lost 7 pounds!). And now you CAN do something about it. Discover personal insights and apply effective psychological techniques to improve all aspects of your life. Even the smallest insights can have a huge and positive impact on you. What's covered in "Mindset Magic" ? What will I get. . .? How is it delivered. . .? We've already started! See you in 2019! What else do I get, Jess? Are there any BONUSES ? “I signed up to the paid course with Jess, because I liked her style - and I knew I’d get good value from working with her. At the time of joining the course, I was working in a male-dominated, bullying, misogynistic environment, and I didn’t know what to change or how. I felt rubbish about my job and I knew that I wanted to explore why. I’ve previously worked with other coaches and I have done courses on the “Imposter Syndrome”, but they were too general, and so I'd never fully explored my Inner Critic and how it affected me. Working with my Inner Critic was not easy. BUT the advantage of this course is that Jess is there guiding you, helping you to make sense of it all. I really benefitted from her ability to see the wider picture; we discussed things I had never even considered. I learned to get better at untangling my thoughts. There are lots of useful techniques on the course, that I still have access to. I honestly believe that if I hadn't made any changes it could have really damaged my professional career, and my own mental health. You'll have the same nagging thoughts, the same sabotages, the same frustration and still feel stuck. You wouldn't be much closer to achieving your goals, but you would have wasted time and energy worrying about them. Your Inner Critic doesn't Want You To Succeed. It doesn't like you to take action, because the only way for you to feel empowered is by disempowering it. It tells you that you don't deserve good things. It's easier to play it safe, to stay small, hide under the radar, not bother with the promotion, not send out that manuscript, not stand up to your critical mother, or your scary boss. The only way for you to feel empowered is to take back control from your Inner Critic. We learn at a young age to parent ourselves in the same way as our parents did. Mine were especially critical, so I became an expert self-critic. This is part of the reason why I trained as a psychologist: to learn how to turn the volume down on my Inner Critic and how to tame her. And over the past 20 years, I’ve not only applied the techniques to my own life, but I’ve helped my clients to realise their self-worth, develop their confidence, and have the self-belief to go after their goals. And now, for the third time outside of my private work, you can access these strategies for yourself in my Mindset Magic 6-week online course. If you’re ready to release yourself from your Inner Critic, get out of your own way and focus on the things you deserve to have in life, then come join us! We start Thursday 11th October 2018. "I’ve started on a path to a new way of thinking and being"
“I signed up to the course because I was extremely hard on myself and self-critical. I also wanted to do something positive and proactive rather than staying in a rut. With Jess’s training videos, worksheets and her support, I understand my Inner Critic much better than ever before. I’ve started on a path to a new way of thinking and being. I couldn’t have done it without this course. Now, if I begin to get down on myself, I notice and remind myself that this isn’t how it needs to be anymore. I’m taking small steps, and there are big differences in my feelings about lots of things now. For me, there’s NO GOING BACK: it may be a long journey ahead but I’ve started and no one is going to stop me now!”. By really tuning into all of the ways that you sabotage your career, your relationships, and or your health, you'll be ready to learn how to deal with them. 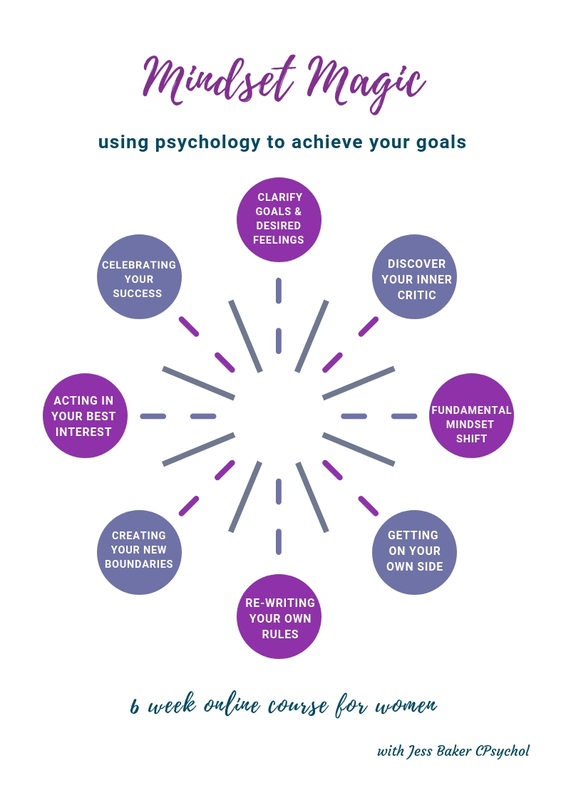 You'll be using lots of well-established psychological methods, to help you move forward on this part of your journey. You'll also be given the chance to be kinder to yourself, and give yourself the compassion you truly deserve. Imagine how much easier your life could be. Imagine how much more productive and focused you could be. Instead of getting in your own way you’d become your loudest cheerleader, boost your courage, your confidence, and begin rooting for yourself with unconditional love. You’ll have more self-worth, and higher self-esteem, a better relationship with yourself, and with others. And this is exactly what you deserve! She has worked across a range of industries designing and delivering leadership development programmes for large corporate clients, and now wants to help empower a wider audience of women. Jess is a passionate coach, and an engaging facilitator. She is often quoted in women's magazines, has trained in stand-up comedy, and enjoys speaking at business and wellbeing events across the UK.